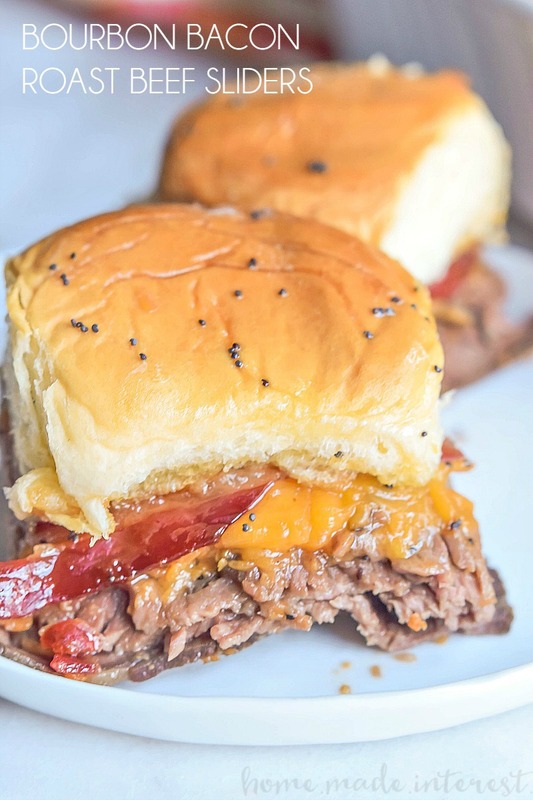 These Bourbon Bacon Roast Beef Sliders are a great game day recipe that is perfect for your next football party! Using our Whiskey Candied Bacon takes these sliders to the next level! Hey guys, we’re Kat & Melinda from Home. Made. Interest. and we’re super excited to be over here at Bread Booze Bacon sharing our awesome new Bourbon Bacon Roast Beef Sliders recipe with you. We’ve been friends with Julie for a few years now and man does that girl know how to have a good time. 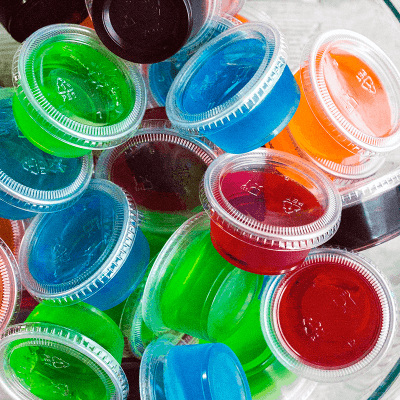 Between the two of us, Melinda and I host a lot of parties and you can bet one of Julie’s unique jello shots is going to make an appearance alongside some of our easy slider recipes at every event. 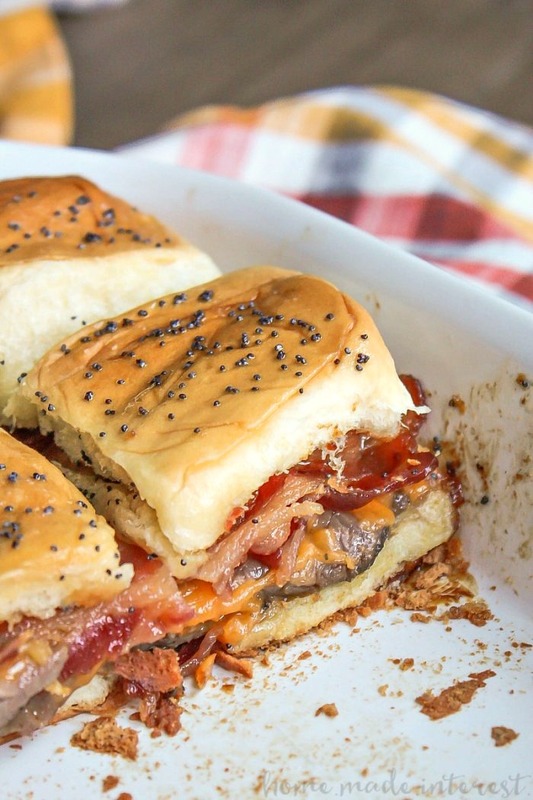 Bread Booze Bacon actually inspired our bourbon bacon roast beef sliders. We were drooling over Julie’s recipe for Jack Daniels Bacon Mac and Cheese and we knew we had to use the recipe for Whiskey Candied Bacon to create the ultimate game day slider. We piled roast beef, bourbon candied bacon, and cheddar cheese on soft slider rolls and baked them until the cheese was gooey, and the smell of candied bacon filled the air. Seriously guys, these sliders are the bomb. 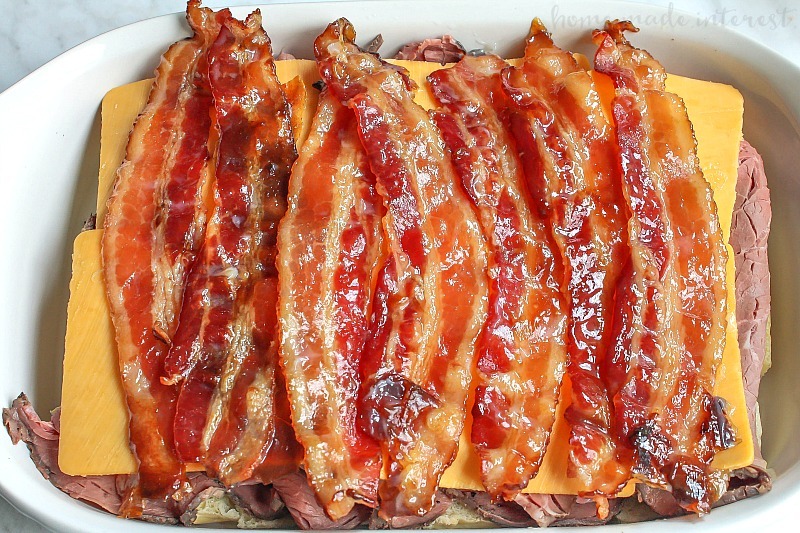 Bacon and roast beef are always good together but you coat that bacon in brown sugar and bourbon and you’re talking next level appetizer! These bourbon bacon roast beef sliders plus Bacon Bourbon Apple Jello Shots sounds like a pretty awesome start to your next game day party right? Now you see why we get along with Julie so well! We’re all bacon freaks. The fun doesn’t stop there, we’ve got sliders for everyone from Philly Cheesesteak Sliders, to Chicken Parmesan Sliders. We even have a sliders ebook filled with easy slider recipes for every occasion. What can we say we love a good party and a good party needs good food! 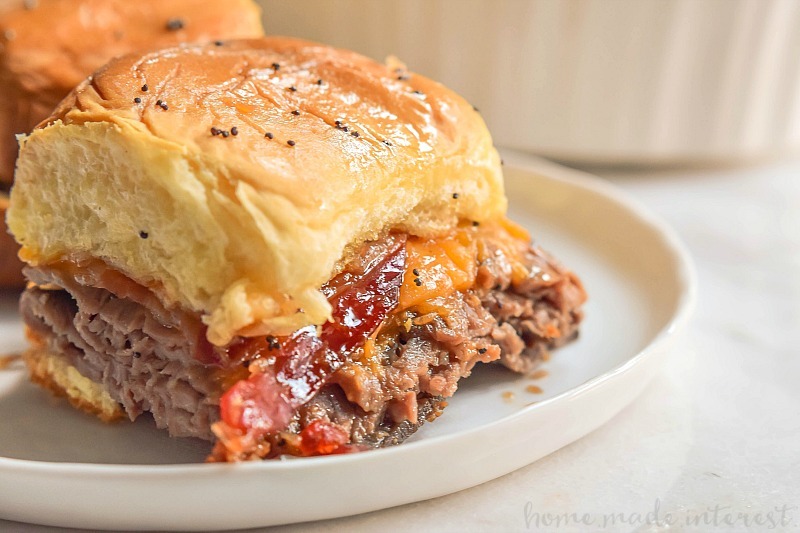 Bourbon Bacon Roast Beef Sliders are a little sweet and oozing cheese. Perfect for game day! Using our Whiskey Candied Bacon takes these sliders to the next level! Place the bottom half of the slider buns in a greased casserole dish. Place a layer of roast beef over the bottom buns. Top with a layer of cheddar cheese slices. Finish with a layer of Whiskey Candied Bacon slices. Place the top buns on the sliders. Cover the dish with foil and bake for 10 minutes, then remove the foil, brush the slider buns with melted butter and sprinkle with poppy seeds. Continue baking for another 10 minutes. If you're using thick cut bacon you may need to bake it longer, until it's crispy and glazed. Dude. The bacon totally made this recipe! My husband ate FOUR! This is my new “go-to” for game days! AWESOME! I totally agree about the bacon. Where do I find whiskey candied bacon? Hi David. Yes, the bacon is cooked first. The recipe calls for bourbon candied bacon, but you could substitute regular, cooked bacon if you prefer…but the candied bacon really makes these sliders! Hi! Is it best to bake the last 10 minutes with or without the foil? Without so they get toasty. If you prefer they are a little softer you can keep the foil on. I am making this for Christmas Brunch! it sounds amazing!! Thank you for the recipe! Can I use a large aluminum baking pan instead of the casserole dish for larger qtys? I’m a beginner learning how to cook for my significant other. I wish you would have stated in the recipe to COOK the bacon before placing it in the oven. I was so excited to finally cook something on my own only to feel like an idiot. As delicious as these were, please put that it should be cooked prior for your beginners. Hi Katie! I’m so sorry there was confusion with the recipe. The bacon ingredient was previously linked to the recipe that explains how to make it and it looks like that link went away when I updated the system I use to display recipes. I’ve updated the slider recipe to have the whiskey candied bacon recipe in the notes so it’s all in one place now. I hope you’ll give these sliders another go. They’re one of my favorites. I really appreciate you bringing this to my attention so I can make this recipe more approachable for everyone. You don’t need any kind of sauce or dreasing on them? Probably would make them soggy.? Making for a large group this Sunday just making sure I didn’t miss anything. Hi Rebecca! No extra sauce needed. The melty cheese and little bit of drip for the bacon (and then the butter brushing) are enough. If you want a sauce, I’d serve it on the side and let your guests add it on or dip the sliders. Can I give this 10 stars??? Holey moley these are so-o-o-o good! It was very difficult to put the bacon on the sliders, after I had tested it!! My better half loved it, too!